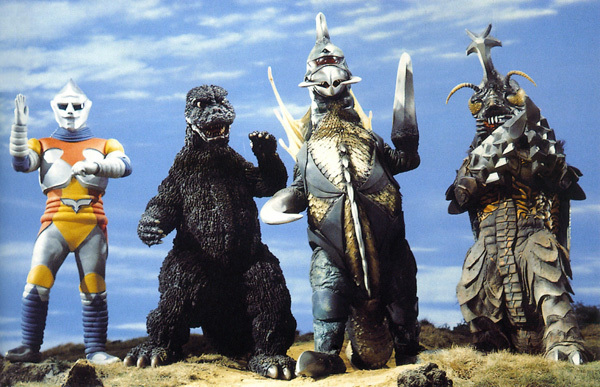 By the release of GODZILLA VS. MEGALON, Godzilla movies had reached such a level of camp that nothing seemed too ridiculous to put onscreen any more. We are asked to accept such a level of idiocy by the filmmakers, it was anyone’s guess whether they were intentionally driving the franchise into the 1960’s BATMAN ditch, or whether they really didn’t know how imbecilic their once-ominous allegory of nuclear abuse had become. Foregoing any semblance of quality, integrity or social edification, it seemed like these numb-brained “monster” movies were being churned out by Toho Company for quantity’s sake. After all, create enough crap and eventually its bulk alone will take on the aura of legacy. Just ask Ed Wood. Inventor Goro Ibuki (Katsuhiko Sasaki) has a totally plausible metamorphosing artificial intelligence robot named Jet Jaguar, which is stolen by an agent of Seatopia, an undersea kingdom that wants to rule the Earth, and use Jet Jaguar to help them. Already, the stupidity is making my neck muscles twist in paroxysm like Gary Oldman in LEON. Seatopia is run by Zap Rowsdower (Robert Dunham, an American actor who chose to speak Japanese, so they wouldn’t be able to dub him properly, I guess). Zap unleashes a monster named Megalon (a gigantic beetle thing with drill bits for arms, laser rays and grenades shot from his mouth) to destroy the Earth’s cities so that Seatopia can take over (and live on the charred wasteland created by Megalon, even though their sea abode looks quite nice and has dancing girls). Megalon first appears over the top of a ridge the same way Gojira appeared in the very first GODZILLA movie (1954). Steal from the best. Jet Jaguar (Tsugutoshi Komada, in a rubber suit that looks like rubber but is meant to be steel, whom I will call “Jet Jagaa” from the Japanese pronunciation, just cos it sounds meatier) grows to giant size (from the giant-growing-mechanism-that-creates-matter-from-nothing, that can be purchased from any hardware store in Japan presumably) and battles Megalon, to no avail. Seatopia sends another giant creature, Gigan (a hawk-like creature with scythes for arms). Waitaminute! Gigan was from the last indulgently over-the-top movie GODZILLA VS. GIGAN (1972), a servant of aliens. How is he now an agent of Seatopia? (I guess the Dental Plan was better.) Together, these two monsters take Jet Jagaa to the cleaners. Until Jagaa summons Godzilla. Yay, shout the children. Is this what it’s come to? After GODZILLA VS. GIGAN, where Toho displayed no shame in using their own movies as stock footage, they now lift that shot of Godzilla jumping into the sea, from GODZILLA VS. THE SEA MONSTER (1966). Why does this once-scary nuclear mutation now look like a puppy dog? Look at the size of his big cartoon eyes, always looking upwards, and – puppeteer eyelids! And is the recording of his “roar” deteriorating? Why is it lacking any bottom end and hurting my cochlea? He sounds like a fishwife. This movie was meant to be a vehicle for the inscrutable Jet Jagaa, maybe turn him into another regular company character like Godzilla, but Toho felt the grimacing humanoid robot couldn’t hold the film as a leading man, so inserted Godzilla and – presto-casho! – another Godzilla monsterpiece shat into moviedom. Army shoots at Megalon. Nothing. Still haven’t realized they’re useless. What’s more – never trying to address the real problem – trying to communicate with the people who sent these monsters. If you don’t use diplomatic means, you’ll never understand the cultural or political reasons for their attempted conquest. Shut up – keep shooting. Godzilla and Jet Jagaa save the day with some sweet wrestling moves and teamwork that would make Hiro and Hito Tojo proud. If the moviemakers had problems with the rubber suits in the beginning (1954), now they’ve really got the handle on how to build these versatile career-destroyers; the rubber looks lighter, more pliable, Godzilla (worn by Shinji Takagi) scamping around like a kid with ADHD; coincidence that is their target audience. The Pitch Meeting: I can see the Japanese execs now, listening to long-time Godzilla writer Shin’ichi Sekizawa and co-writer/director Jun Fukuda pitching their key scene: Megalon and Gigan surround Godzilla and Jet Jagaa with a ring of fire; as our heroes cower back to back, the tension is unbearable as the flames close in… what to do?! Oouaah! Of course, Jet can fly (he’s named Jet, fer chrissakes!) and Godzilla walks through fire regularly and eats nuclear reactors for a well-balanced breakfast! Uh, so no real tension, sorry… can we get the funding anyway? The Sharkzilla Jump: Godzilla takes a running start and slides across the ground on his tail to kick Megalon. Japanese execs snort awake. Now that’s entertainment! Funding! The 2nd biggest WTF moment in a Godzilla film. Writers: Jun Fukuda, Takeshi Kimura, Shin’ichi Sekizawa. Starring: Katsuhiko Sasaki, Hiroyuki Kawase, Yutaka Hayashi, Robert Dunham, Kotaro Tomita, Kanta Mori. GODZILLA: Shinji Takagi. MEGALON: Hideto Odachi. JET JAGUAR: Tsugutoshi Komada. GIGAN: Kenpachiro Satsuma. Version: MST3K edit. Japanese with English dubbing.